Christmas decorations have started going up all over the place, Christmas merchandise is in every store and it's probably just me, but when I see this, my mind starts to wander towards Christmas sweets (mind you that doesn't take much). Yup, before we know it, Christmas will be upon us. I must admit, this is my absolute favorite time of the year. Let's talk sweets now, shall we? What's your favorite? Me, I love them all. Old school, traditional Kuswar, new age desserts and sweets, the whole lot. But of all of them I think that my favorite is the Goan Guava Cheese (almost like Guava gummies or candy, but better) known as Perad. I have previously posted a perad recipe using fresh guavas here. But here, in Sydney, I haven't been able to get my hands on any fresh guavas, especially this time of the year. So imagine my joy when I came across this on one of my weekly grocery shops at my local Supermarket. Ofcourse, I grabbed a couple of tins and knew that I had to try making Perad with them. (I have also used the "Koo" brand with the same great results.) I mean, I knew it wouldn't be like using fresh guavas, but how different could it really be? So I tweaked the recipe a tiny bit and crossed my fingers while the perad cooked and set. To my delight, this was the best Perad I had ever made or eaten. So it's safe to say from now on, while I can get my hands on these canned guavas, I'm going to stick to using it for my Perad. 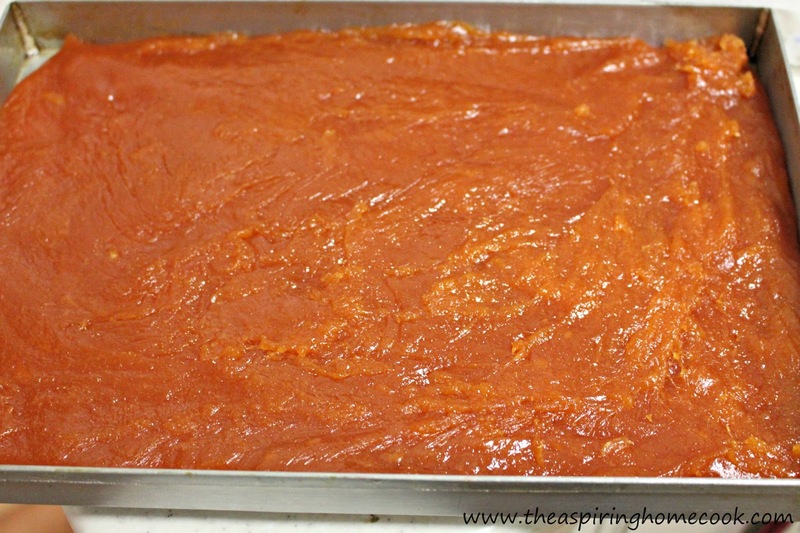 Place some of the ghee on a large metal cookie sheet / baking pan and spread on the bottom and sides and keep this aside. 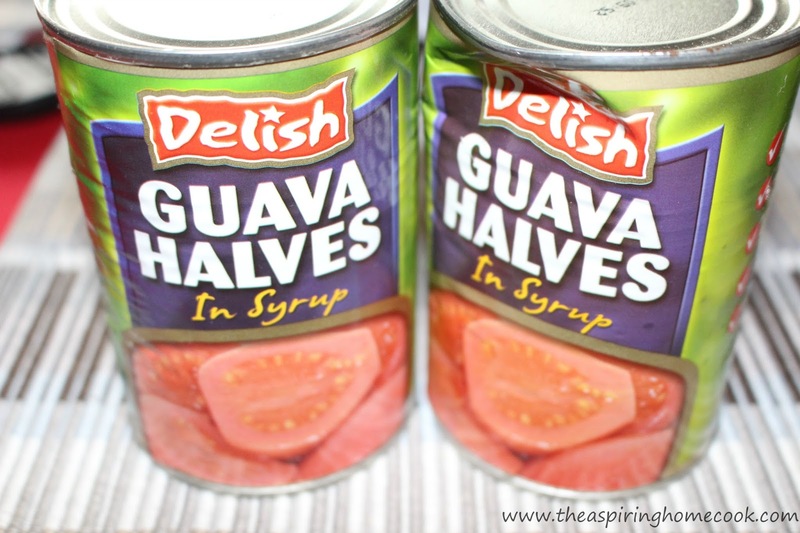 Drain the guava halves and reserve the syrup. Scoop out the seeds and set aside. Puree the halves till smooth and put the puree in a heavy bottomed vessel. Now Goan sweets are notorious for taking ages to cook, but I have found if you use a wider vessel, its cooks a lot faster because of the increased surface area. So I use a stainless steel 12" Kitchenaid Skillet for all my sweets and it drastically reduces the cooking time. Now place all the seeds, that were previously scooped out, in a strainer, add a couple of spoons of the reserved syrup from the cans and stir through the strainer to extract all the guava puree from the centres. You may need to do this a couple of times adding a tiny bit of syrup each time to extract all the guava. Add the extract to the pan and now discard the seeds. I usually end up with about 370g pulp from the halves and about 250g from the centres. In all about 620g of guava pulp. Other recipes call for a lot more sugar, but since these are canned guavas in syrup they are sweeter than the fresh ones, so I've cut down on the amount of added sugar in the recipe. 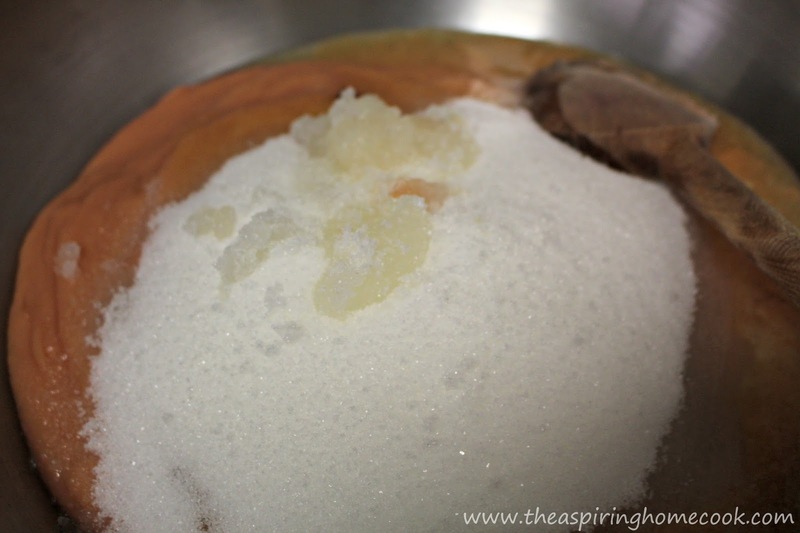 Add the cloves and the sugar to the pan. Place the pan on medium heat and stir continuously using a wooden spoon with a long handle. 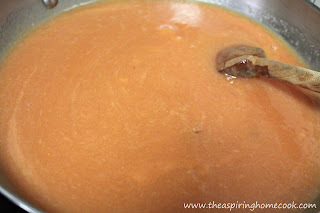 The guava mix tends to sputter and spit while cooking and the long handle will prevent the mix splashing on your arms. Make sure that when you stir, the spoon gets to the edges of the pan to prevent it sticking to the bottom of the pan and burning. If the mix sputters too much, lower the the heat and continue cooking. When the mix thickens, extract the cloves carefully and discard. Continue cooking till it leaves the sides of the pan. Keep stirring. Test to see if done. (Use water test - Place some icy cold water in a small bowl and drop a teaspoon of the sweet on it. If it firms up on cooling it is done. If it is still very soft or too sticky, it needs more cooking). When done, pour the mix into the greased pan. 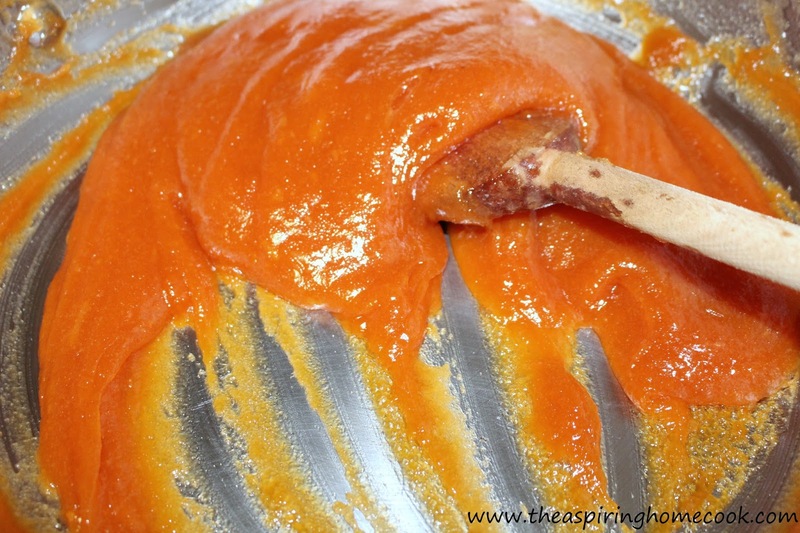 Using the back of a large spoon that has been greased with some ghee spread the mix to form an even slab and set aside to cool. When it has cooled down a bit, using a knife that has been greased with some ghee, cut into cubes. You may need to grease the knife a couple of times while cutting to prevent it sticking. When it has completely cooled, store in an air tight container. 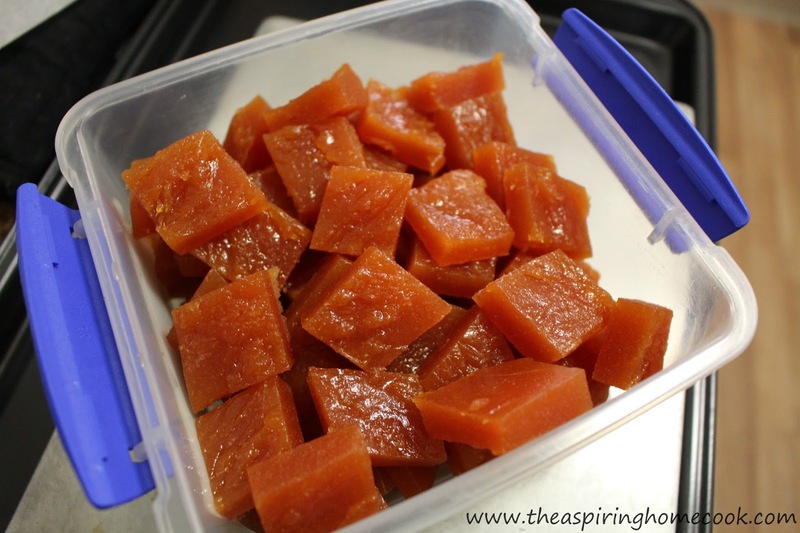 If you are making this ahead of time or if it summer like in our part of the world, refrigerate till you are ready to use.